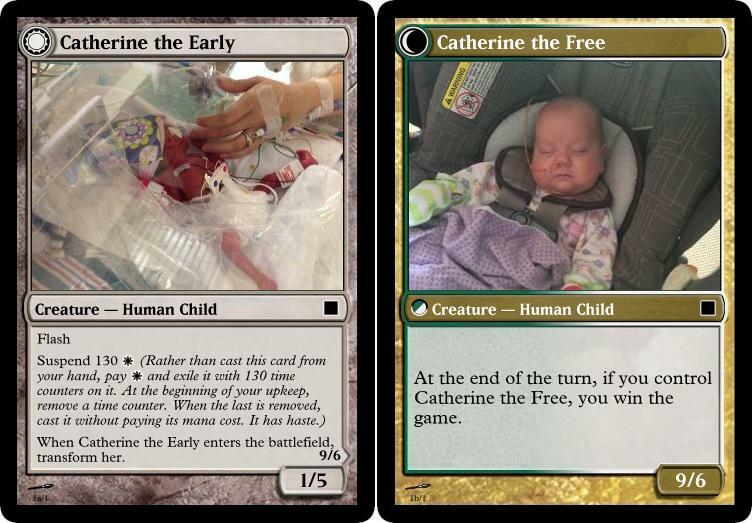 Catherine, our daughter, is doing pretty well all things considered. There are still some hurdles that we have to get through, but we’re doing it together as a family. I want to thank everyone for their well wishes and support. To the right you see this card that I designed about her (mostly so I could talk about her in this blog). Yes, she was in the NICU for 130 days (the suspend cost), and the P/T was her birth weight and departure of hospital weight (1 pound 5 oz and 9 pounds 6 oz respectively). She is 6 months old and just over 11 pounds now and is acting like a baby of her estimated due date adjusted age should be (around 2 1/2 months). It’s all getting better. And because of this I’m restarting this blog and 99 CMDR Problems (where I talk about updating my decks and I want you to decide which one I’m writing about first). But we’re here to talk about the design of Magic. Website IGN put up a walkthrough video of the new Duels of the Planeswalkers game and “leaked” some of the new cards. Since M11, each of the Core Sets have had a returning mechanic (M11 – Scry, M12 – Bloodthirst, M13 – Exalted, M14 – Slivers). In M15 the mechanic looks like it shall be Convoke. And this makes me happy. Of these two, I think only Enhartened Spirit has a remote chance of being printed because the Legendary creature looks too much like a Theros God. 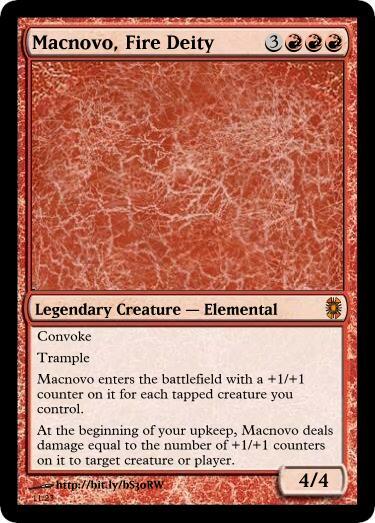 However, I can tell you a ton about Convoke and how that fits into the Theros block pretty well. If you never played with Convoke, or forgot what it does, let’s talk about it. Basically you tap creatures to make your spells cheaper; the more creatures you tap the cheaper your spells are. Originally this appeared in Green/White because they were the two token making colors; personally like the idea of Green using creatures to cast spells and White because of the community aspect of casting a spell together. It’ll seem odd to see these in all five colors but they can fit flavorwise (Blue to show off knowledge, Black to be greedy (using your creatures to cast your spell), and Red to give up defenses for the now). Whenever a creature becomes tapped, [Effect]. P/T = number of tapped creatures you control. As long as CARDNAME is tapped/untapped, [Effect]. When CARDNAME becomes untapped, [Effect]. If you look in there you see the following line: “When CARDNAME becomes untapped, [Effect]”. Do you recognize it? You should. Yes, one of the ways that I thought that would make an environment work with Convoke was the Inspired mechanic. Of course, it wasn’t created then and it’s not really a new concept: it’s basically the untap mechanic reworked slightly. Aside: What the real problem for Inspired was that it seemed completely out of place. Sure, you can attack with those creatures but not all of them want to attack. There were very few ways in block to tap them for an effect (Springleaf Drum), but having a mechanic that benefits from tapping creatures is the best use of that mechanic. /Aside You can see how tapping “for free” to get its effect the next turn is great synergy. We have to wait 6 months to see this play off (but it’ll be together forever in casual land now). What Theros also did correctly for Convoke was push mono-color play. For Convoke to work properly, you want to make sure that creatures are the same color as the spell you’re trying to cast. The more creatures that share the same color the easier it is to cast the spell. With Devotion, you want creatures on the table so the mixture of these two keywords works fantastically here. As you see from my “mini-God” above, the mechanics can go hand in hand to make a deck run smoothly. If you’re going to see cross-block decks work, I bet you’ll see Devotion and Convoke work side by side. Now, all of those ideas are for making an environment work. You don’t have to use all of those, and most of those won’t even come into play (When was the last time you saw a creature that changed colors?) That being said, it wouldn’t surprise me to see some of Lorwyn/Morningtide’s Merfolk from being reprinted (I like Surgespanner since WotC doesn’t want to touch Tradewind Rider. Limited needs these types of cards to make drafting better. I also came up with another list of variants of Convoke, if it were to come out over a block there would need to be some “upgrading”. I doubt anything like this is going to happen in a Core Set since they like to keep mechanics more to their basic concept. For each tapped creature you control, [Effect]. For each creature tapped used to cast CARDNAME, [Effect]. Tapped creatures gain a bonus/effect. “Action Keyword” – If CARDNAME was cast without mana, [Effect]. “Action Keyword” – When CARDNAME enters the battlefield, tap any number of untapped creatures you control. CARDNAME gets that many +1/+1 counters. These can all deal be variants on Convoke. The real key to making these work, however, is to make it more than using Convoke to cast spells. If you make the creatures you tap part of the size of the effect, then you can make Convoke a variable mechanic instead of just a static one. By having effects that scale by the number of creatures you tap, suddenly a burn spell can do more damage at a later part of the game because the number of creatures you tapped for it. It doesn’t have to be an X-spell like Chord of Calling is, but it does have to be a little more complicated. Want a Green effect in a Red spell? Make the effect happen if you tap a Green creature while casting the card. There is plenty of virgin space here to mess with so while it makes me happy that WotC is printing Convoke again, I with they could expand on in outside of a Core Set. That doesn’t mean nothing good will come from the mechanic in M15. We could get a “free” counterspell with Convoke. See, that outta make you smile, right? Right? I love the Convoke mechanic from when I first saw it. It allows players to use creatures as a resource for mana, something only very few creatures did before hand. You don’t have to tailor your set to make it work, but I feel like it’s much more of a headline mechanic than when it’s been credited for. There’s so much area that can be explored with the mechanic that I think designing the environment and making it work with other possible keywords is what made me chose it for my GDS2 entry. We obviously don’t know what’s in this set and it may surprise me with my low hopes. But don’t be caught off guard when you see some subtle card hints at anything of the first list up above. It’ll help smooth out Limited. But my issue with Limited and set construction has to wait another day. Thanks again for all the support everyone and the understanding. It’s good to be back. I’ll get this blog running in no time. Really glad to see you and your family are doing well!! Glad to see you back! Indeed, it makes a startling amount of sense to see Convoke after Inspired – hence my educated guess that it’d be returning, especially considering MaRo’s frequent hints as such. Convoke is mostly going to be ‘boring’ in the core set, but even ‘boring’ is better than nothing! 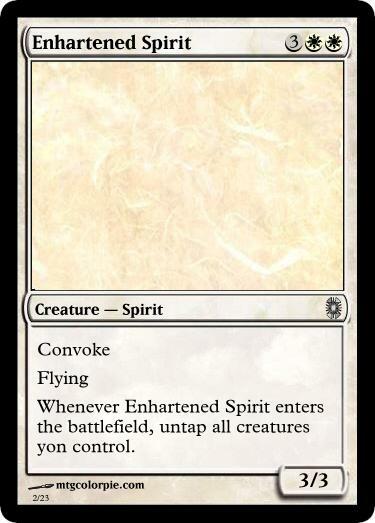 I”m excited to see some of the simple and sweet designs that can be made when Convoke is explored in other colors. Glad you’re baby is doing better! This was a really nice find while I was surfing the internet. I am glad your daughter is healthy now and safe! 🙂 Very cool!